After finding his musical feet in the legendary punk band Crisis and the (in)famous Death in June, Tony Wakeford has been releasing records under the name of Sol Invictus since 1987. His list of collaborators reads like a who’s who of the musical underground – Steven Stapleton (Nurse With Wound), David Tibet (Current 93), Matt Howden (Sieben) and Kris Force (Amber Asylum) – but Sol Invictus is an underground institution in itself. Sol’s music is a place where punk collides with chamber music, and industrial noises chitchat with folk tunes. Recurring lyrical themes deal with disillusion and doubt, ideals and cynicism, often drawing on Wakeford’s own life experiences. I am a fat despot to a number of noise serfs in the neo-dreary pop combo Sol Invictus. I also take part in a number of unlistenable and it seems unsellable side projects. 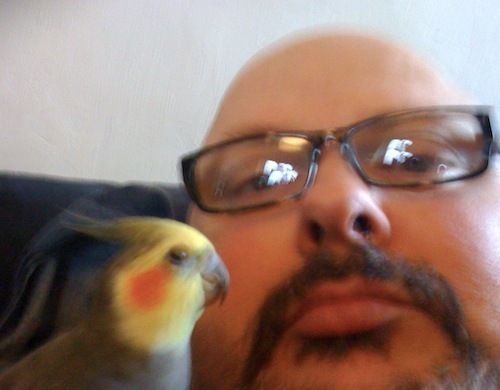 I have been married to a loud American wife (Renee), for 13 years and servant to a sociopathic parrot (Fred). As if this wasn’t enough, I am a slave to the worlds sweetest but possibly silliest Cat (Pussolini). I find your sarcasm amusing and you humbleness refreshing! American wife! gay parrots! sweet and silly cat! Sounds like British comedy at its best! How did we fall into this? I am in the same boat.. Loud Polish wife and a slave to our 3 feathered children. visiting Holland , doing a concert would be great..!